My level of fondness for someone is often reflected in the sweets I bake for them. 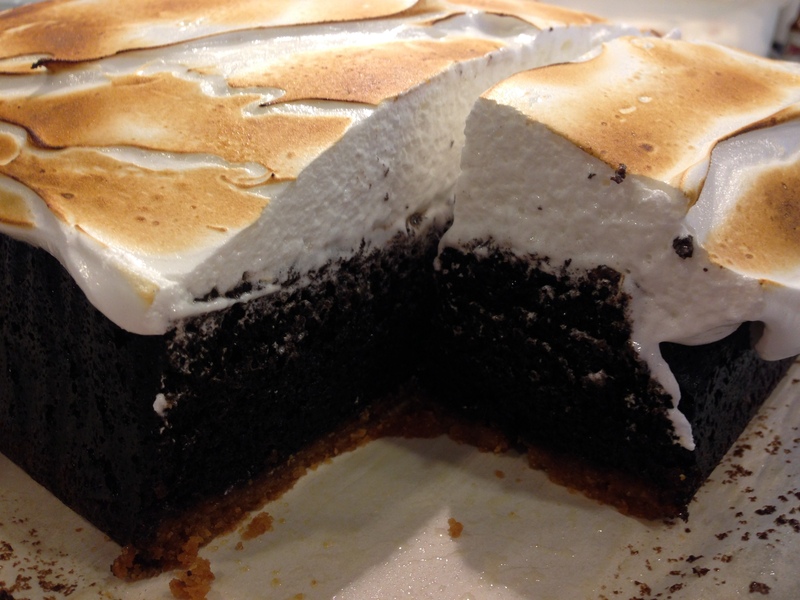 And as you can see from the pictures of the S’mores Cake below, this cake was baked for someone pretty special. 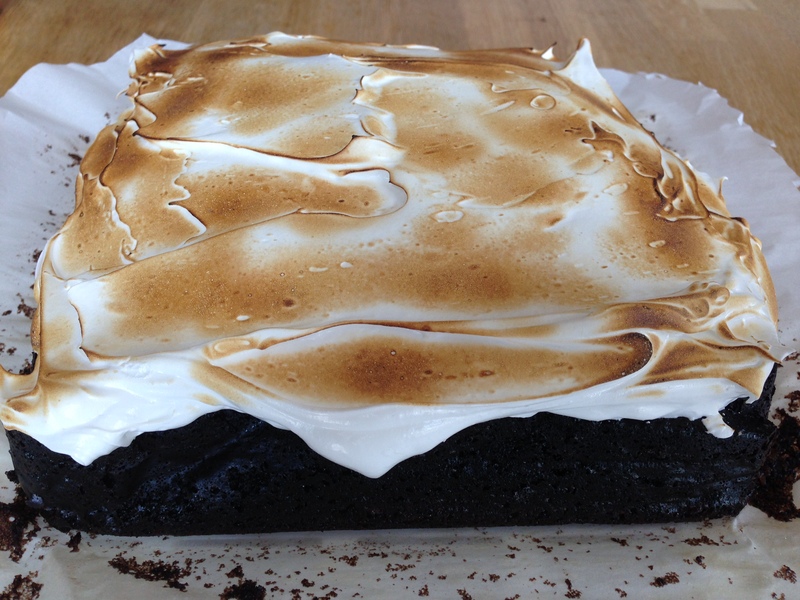 On top of a dense graham cracker crust sits a dark, tender, chocolate cake that’s piled high with fluffy marshmallow meringue. To get that extra dark chocolate color and flavor, I used half black cocoa powder and half all natural cocoa powder. I also used a small brûlée torch to brown the marshmallow topping and give the cake a just-roasted-over-a-campfire look. The cake takes a bit of time to make because of its three different components, and the cake should be fully cooled before adding the marshmallow topping. But for the right person, it’s totally worth it. 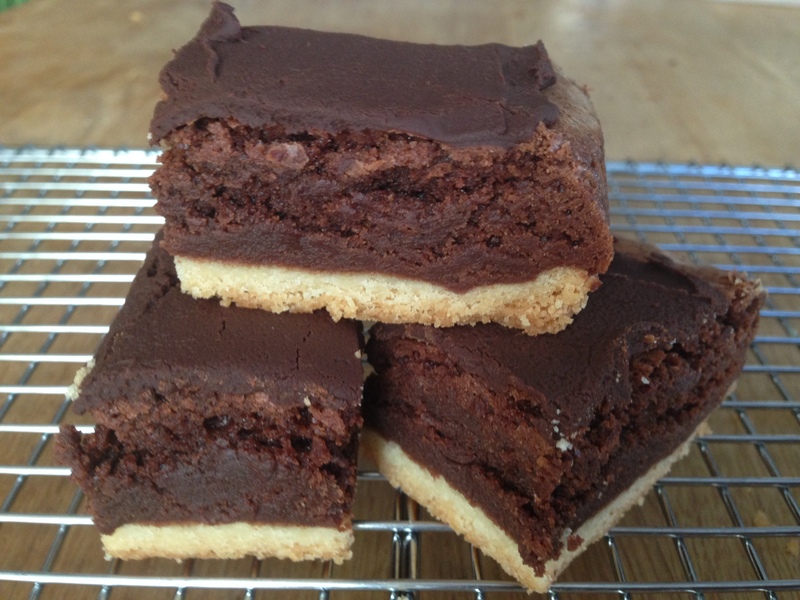 The graham cracker crust is hiding under the thick layer of chocolate cake. This is a photo before the marshmallow topping has been brûléed. Post-brûlée, this cake looks even more ridiculously delicious. Here’s a close up of the cake with the graham cracker crust peeking out. And here’s a slice of heaven. Note, after sitting out in a warm kitchen for a few hours, you can see the marshmallow topping has melted a bit and is in moderate danger of sliding off the cake. Heat oven to 325°F. Grease and line an 8×8 inch pan (make sure the sides are at least 2 inches high because the cake rises a bit) with parchment paper, making sure the parchment extends up the sides of the pan. In a food processor, pulse together the graham crackers, sugar, melted butter, and cinnamon (if using) until they are well mixed and come together like slightly wet sand. Firmly press the crust mixture into the bottom of the prepared pan. A spatula is useful in pressing the crust down. Bake the crust for approximately 9 minutes (it will not brown but will smell fragrant), and then remove from the oven and set aside. Add the egg, buttermilk, and canola oil to the dry ingredients, and mix well. Add the water and vanilla to the mixture, and mix well. 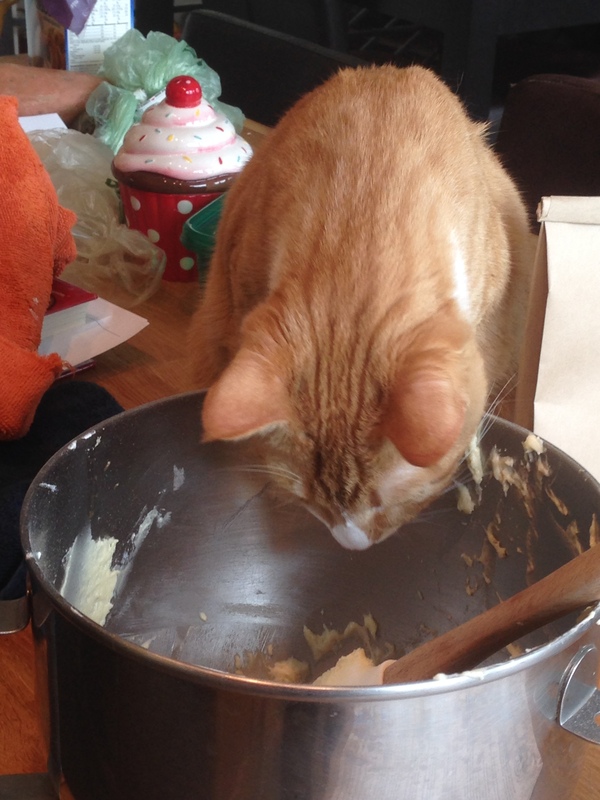 Don’t worry if the batter looks very liquidy. Pour the batter into the pan over the graham cracker crust. Bake for approximately 50 to 60 minutes, until a cake tester comes out clean with no crumbs attached. When the cake is done, remove from oven and allow it to fully cool. 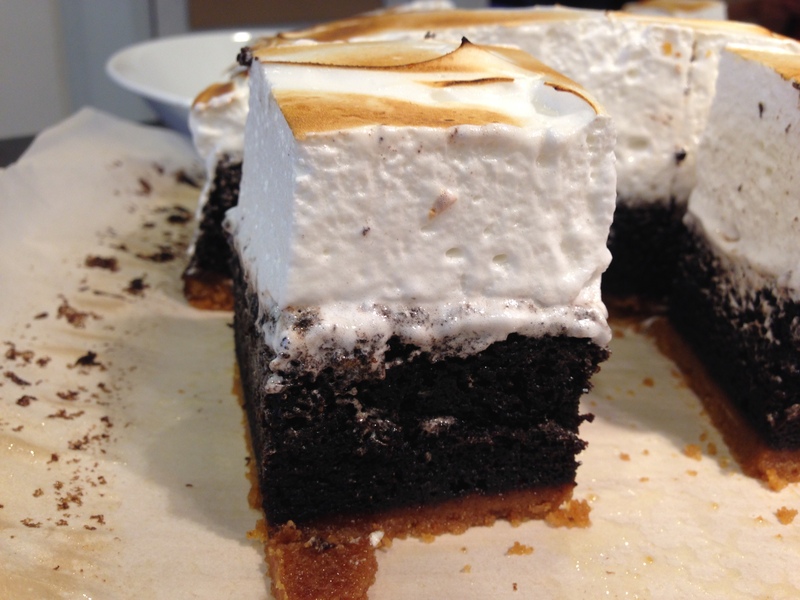 When the cake is cool, make the marshmallow topping. Combine the egg whites, a pinch of salt, and cream of tartar in a metal mixer bowl. Using a whisk attachment, beat until peaks form. Gradually add the sugar to the mixture and beat until stiff, glossy peaks form. Using the parchment overhangs, carefully remove the cooled cake from the pan. Set it on a firm surface, and spread the marshmallow topping on top of the cake. If you’d like, use a brûlée torch to brown the marshmallow topping. 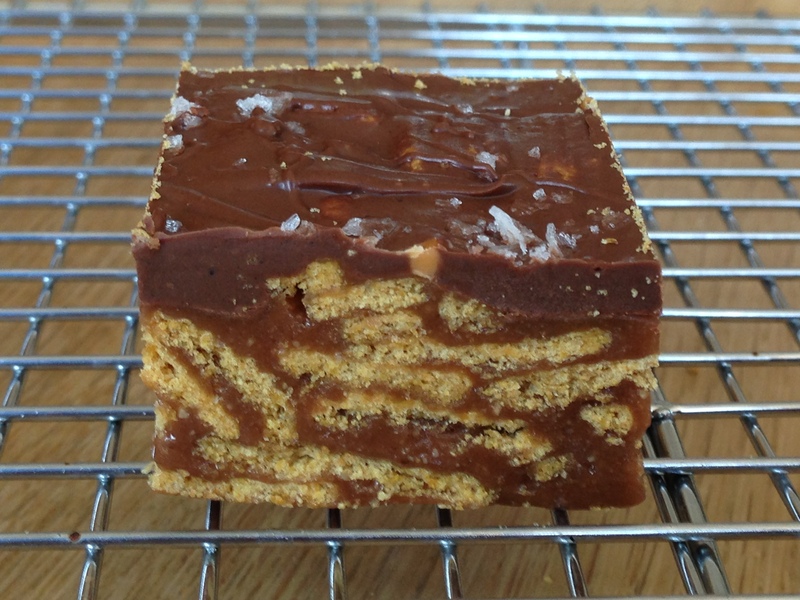 This cake is best eaten within a few hours after it’s made. 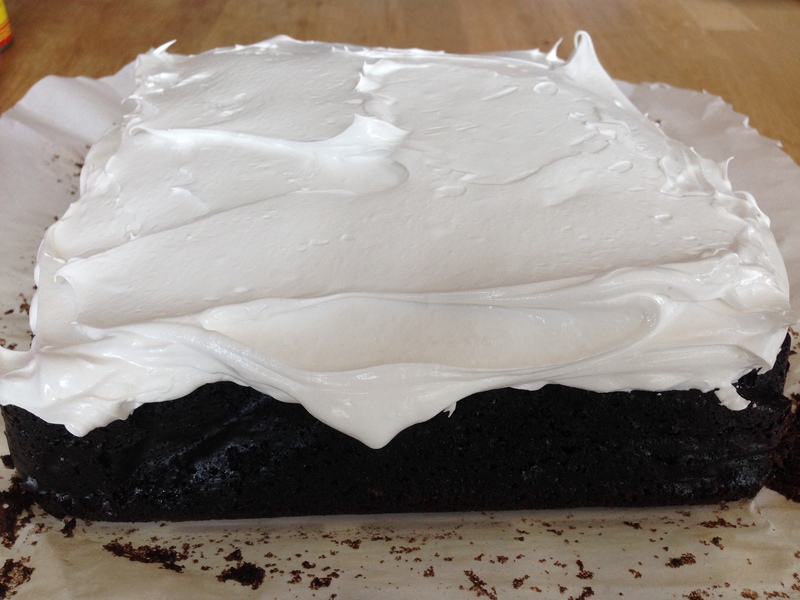 If the weather gets too warm, the marshmallow topping will start to sag and slide off the chocolate cake. Summer is bikini, bbq, and banana bread season. The weather has been so warm lately that my bananas have been ripening at warp speed. 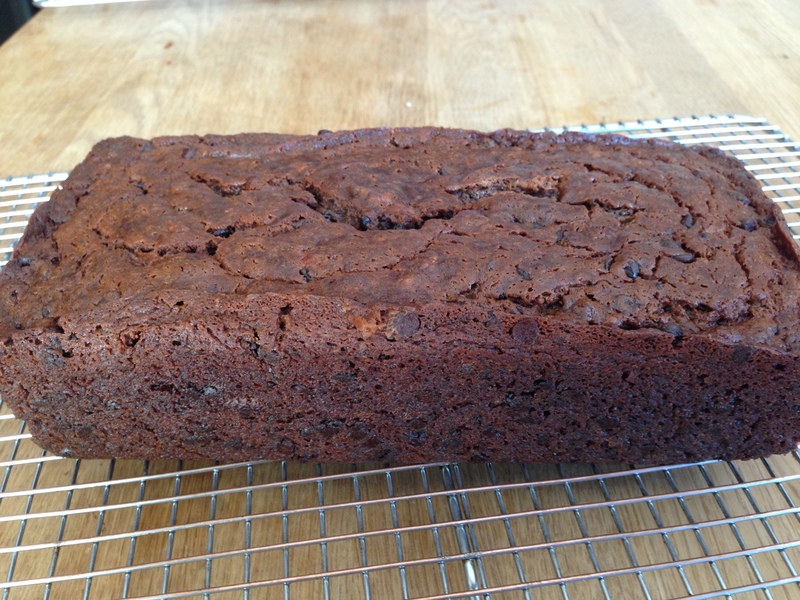 Rather than going with the usual banana bread recipe, I made Double Chocolate Banana Bread. 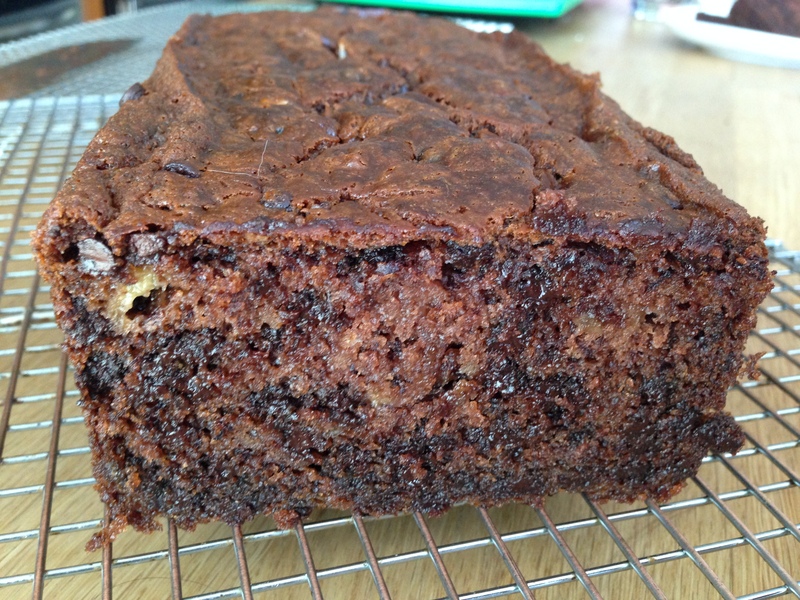 This version of banana bread is super moist, tender, rich and chocolatey, with a hint of banana. I especially like the crispy top and edges. This recipe is is definitely in my top 10 favorites and had everyone asking for seconds. Makes one 9″ x 5″ loaf or two mini loaves. Preheat the oven to 350°F. Lightly grease two 3 1/4″ x 5 3/4″ mini loaf pans, or one 9″ x 5″ loaf pan. Combine the flour, baking soda, salt, and cocoa in a medium size bowl. Beat the egg into the butter-sugar mixture. Stir in the vanilla, banana, and sour cream to the wet ingredients. For those times when you just can’t decide if you’d rather have a regular cookie with semi-sweet chocolate chips or a chocolate cookie with white chocolate chips, I present to you a cookie that seamlessly melds both worlds. These perfectly balanced Yin Yang Chocolate Chip cookies consist of a regular chocolate chip cookie on one half and a chocolate cookie with white chocolate chips on the other. They’re thin, yet sturdy with a soft center and crispy edges. So no need to go to yoga to get centered; go get your Zen on by baking these cookies! In a large bowl, combine the sugars, butter, shortening, vanilla and almond extracts, and vinegar, beating until smooth and creamy. In a separate bowl, combine the flour, salt, and baking soda. Then mix the flour mixture into the wet ingredients. Mix the semi-sweet chocolate chips into the other half of the dough. Use a spoon (or a teaspoon cookie scoop) to scoop the chocolate dough onto the prepared baking sheets, leaving 2″ clearance on all sides. Using your hands, press the two doughs together and roll them into a ball, being sure not to blend them. Press down lightly on the balls to flatten slightly. 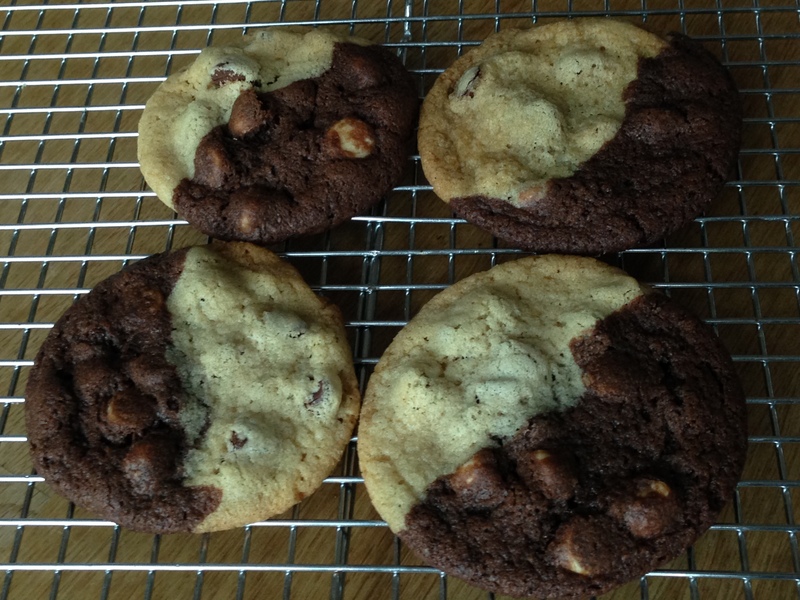 Note, in order to get the “yin yang” look to the cookies, make sure that half of the regular dough and half of the chocolate dough is visible when you place the dough ball on the cookie sheet. Remove the cookies from the oven, and cool them on the pan until they’re set enough to move without breaking. Don’t know how to turn on the oven? Don’t like to read and follow complicated directions? Not enough time to bake? Too lazy to put much effort into making something? Insecure in the kitchen? Whatever excuse you have, sweep it out of the door. 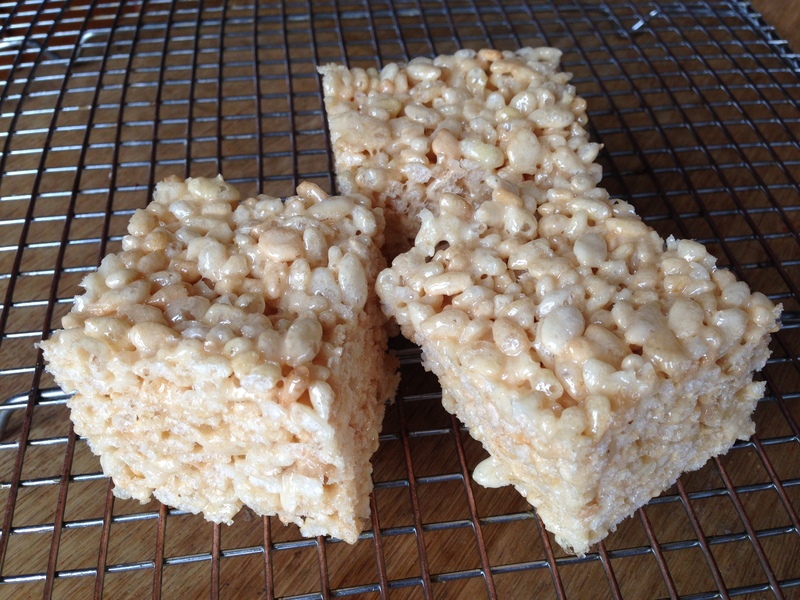 Here’s a recipe that anyone can make, and when I feel lazy but want something sweet, I whip up a batch of Rice Krispie Treats. You only need three ingredients, butter, marshmallows, and rice krispies, and the only kitchen skills you need are the ability to melt butter and marshmallows together and a strong arm to stir. Prepare a 13 x 9 x 2-inch pan by coating it with cooking spray or greasing with butter. In large pot, melt the butter over low heat. Do not set the heat too high or the butter will brown and burn. Add the marshmallows to the melted butter, and stir until completely until they’re well combined and melted. Keep the heat low so that marshmallow-butter mixture does not brown. Remove the pot from heat, and immediately add rice krispies cereal. Stir until well combined. Immediately pour the mixture into 13 x 9 x 2-inch pan, and using buttered spatula, wax paper, or parchment paper, evenly press mixture into the pan. Cool, and cut into 2-inch squares. Put the fruit in a food processor and pulse until completely smooth, about 1 to 2 minutes. Pour the fruit puree into a medium saucepan, stir in the lemon juice, and bring to a boil over medium-high heat, stirring occasionally. Reduce the heat to low and cook, stirring often, until it’s very thick and reduced to 2/3 cup, about 20 to 26 minutes. Remove the pan from the heat and add the honey, to taste, and the salt. Stir until well combined. Position an oven rack in the center of the oven and heat the oven to 175°F. Line a cookie sheet with a nonstick liner (like Silpat). You can use parchment paper if you don’t have a nonstick liner, but it will be more difficult to peel the dried fruit from the parchment paper after baking. Scrape the puree onto the center of the sheet and using an offset spatula, spread evenly into an 8×12-inch rectangle (it should be about 1/8 inch thick). Bake until the puree looks dry and is tacky, but not sticky, when you touch it with your fingertips. This can take as little as 2 hours. It took about 3 hours for my fruit strips to get tacky enough. Turn off the oven and let the fruit cool in the oven and continue to dry out. 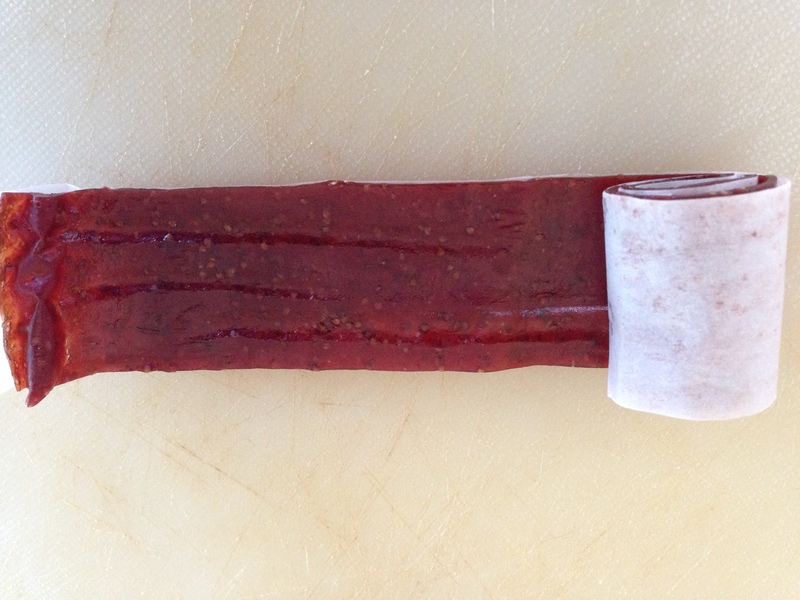 After 2 hours, test the leather to see if it is mostly dry and can be peeled easily from the liner/parchment paper. If the fruit is not dry enough, leave it in the oven for a few more hours or overnight. I left mine in the oven overnight. Cut a piece of parchment into an 8×13-inch rectangle. Arrange the parchment on top of the dried fruit, leaving about a 1-inch overhang on one long side, and press gently to smooth out any wrinkles in the fruit. Smoothing out the wrinkles is easier said than done. As you can see in the photo, my fruit was quite wrinkly but that might be because I used parchment paper to line the cookie sheet instead of a Silpat. Invert the nonstick liner/initial piece of parchment so that the second layer of parchment is on the bottom, and carefully peel away the liner/first piece of parchment. If you used parchment as your initial liner, this is where it gets a bit difficult to peel off the fruit. Fold the overhang on top of the fruit and beginning with one long side, roll the leather and parchment together into a tight roll, jelly roll style. 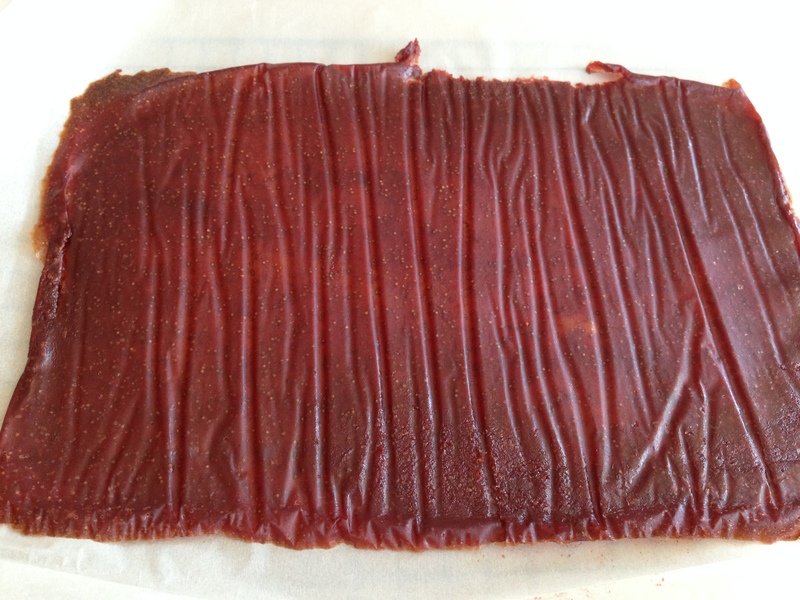 Using a sharp knife, cut the fruit leather into 1-inch pieces and stow in a ziptop plastic bag at room temperature for up to 3 weeks.